Mali, Chowkidar, Attendant, Gangman, Mahout, Peon, Ticket Collector, Daftry, Head Watchman and Distributor jobs. Candidates who qualified SSC or 10th class they are only eligible for this National Zoological Park Delhi MTS jobs. 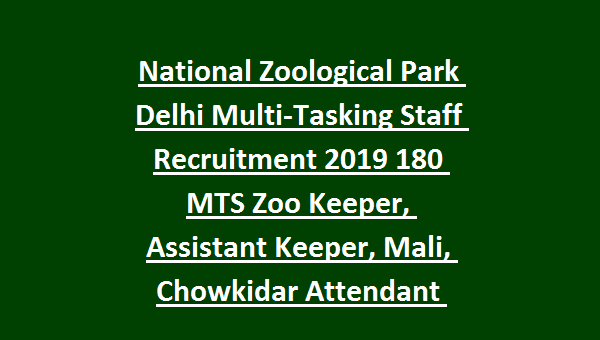 There are total 180 posts available in this National Zoological Park MTS Recruitment 2019. A written exam will be conducted for this National Zoological Park MTS Jobs. Interested candidates can submit their application form to Ministry of Forest and Climate Change before the closing date of 06-01-2019. Detailed information regarding MTS Posts in National Zoological Park recruitment is updated below. 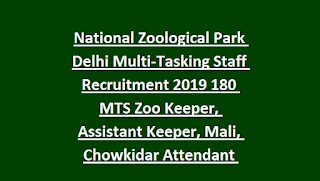 There are total 180 posts in this MTS recruitment of Ministry of Forest and Climate Change for National Zoological Park. For all the posts candidates must have qualified 10th class or ITI. Age limits are 18-25 years for these MTS Posts. Candidates will be selected based on merit in written exam or interview. Application is available to download at http://envfor.nic.in/. Last date to submission of application form to MOEF is 06-01-2019.